On my way home last night I got the chance to take some photos of the Calgary skyline at night… and also got my first proper chance to try to take some long exposures of car headlights. I guess this entry is more of a reminder for myself as I keep forgetting the syntax todo this… its pretty simple and since I use the command all the time you’d have thought I’d have remembered it! This is probably one of the coolest uses of physics ever… [1 Billionth Scale Ion Model Of Enterprise-D] … well maybe not very practical though. I thought its been ages since I actually wrote about some music so here goes. 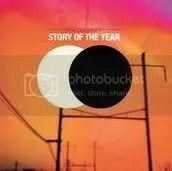 The album I’m currently spending alot of time listening to is [Story of the Year] – The Constant. Though I’m not sure any of the tracks live up to their debut single (of 7 years ago), “Until the Day I Die”, its still quite nice. I feel that the music here shows a progression of age. There is definitely less screaming, that or maybe I just don’t notice it anymore. I quite like “Holding on to you” – resonates well with me at the moment. I guess its a bit “pop-y” and not very pop-punk. That probably describes my tastes quite well at the moment. Though if you are about to forget what Story of the Year are about you are hit with a wake up call in their next track “Won Threw Ate”. That really gets me going on the way to work. Overall I’m loving this album and was kinda-what I was expecting and I was pleased. Compared to some of the releases of other bands recently it was nice to have something that hit the nail on the head. “Eye for an Eye” nicely finishes off the album.. and normally by that point I’m ready to work.